Knowing how to wash bathroom rugs properly will help you get them clean without destroying them. These practical rugs do need regular laundering. They’re in your bathroom, after all, and depending on their location they collect a lot of hair, moisture, and misfires — especially if you have young boys. While their rubber-backing makes them safer to use on the tiled flooring typically found in bathrooms, it also means you can’t just throw them in the machine with other items and expect them to last. 1. Look at the care label. Most bathroom rugs are machine-washable, but it’s a good idea to see if yours has special laundering instructions such as heat-free drying. 2. Shake the rug outdoors. Shake the rug outside to get rid of as much hair as possible. It’s also a good idea to do this at least once a week between cleanings. 3. Double up. To keep your washing machine balanced, add two bath rugs at a time. 4. Use the right products. Don’t use bleach, which can break down the rubber backing and ruin them. Vinegar is also another no-no since its acidic nature will destroy the rubber backing. Instead, treat stains by adding oxygenated bleach along with your regular laundry detergent. Also add 1/2 cup borax to disinfect and kill both mold and mildew spores. 5. Use the right temperature. Hot water will loosen the glue that holds the carpet fibers to the rubber backing. Eventually, rugs washed in hot water will fall apart as the adhesive disintegrates. Since you’re using borax to disinfect the load, and oxygenated bleach to deal with stains, your rugs will come out perfectly fine if you use the cold wash and rinse cycle. 6. Air dry when possible. If you can, it’s best to air dry your rugs to preserve their rubber backing and adhesives. Drying them in the sun helps sanitize them, too. When that’s not possible, run them in the dryer just until they’re thoroughly dry — usually around 20 minutes — and remove them immediately. 7. Treat them properly. 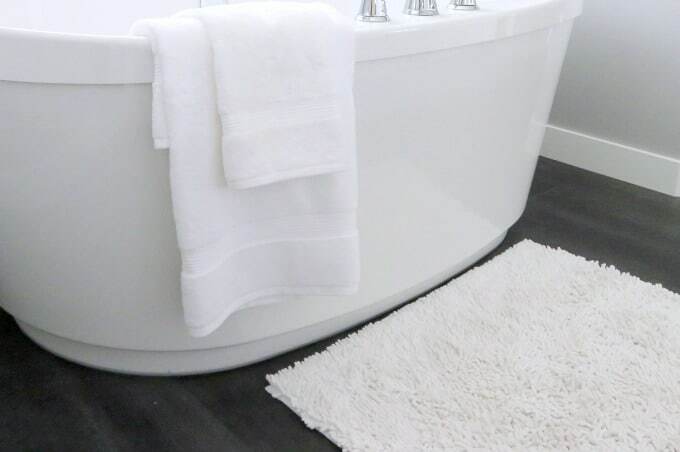 Bath rugs that get wet frequently, like those placed in front of a shower or tub, can quickly develop mold and odors. 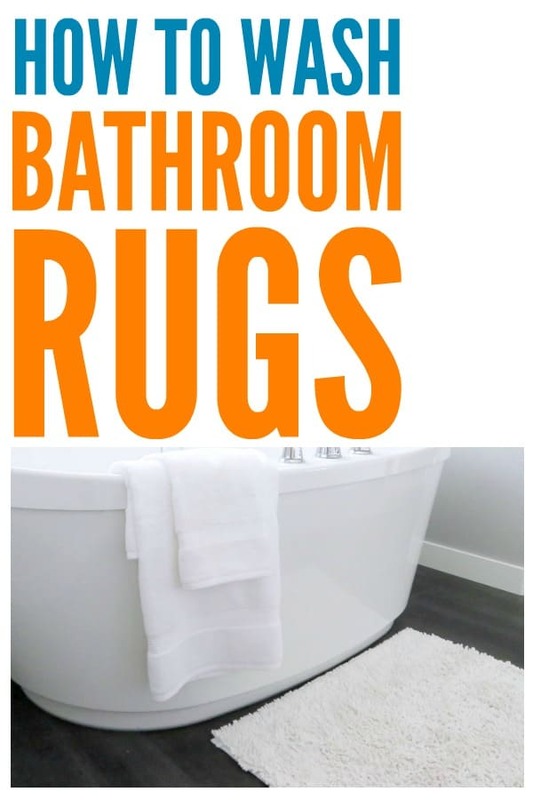 Make a habit of picking these rugs up after bathing and hanging them on the side of the bathtub or over a towel rack, so they have a chance to dry out. How Often to Wash Bathroom Rugs? As for how often you should wash bathroom rugs, it depends on your family’s cleanliness. For those who are toilet-training little ones, or who know a family member has issues aiming, you should wash them at least once a week. Otherwise, monthly laundering is sufficient. The most important part is knowing how to wash bathroom rugs correctly, so you are cleaning and sanitizing them without damage. I’m not sure what you mean by bathroom pads. If you mean cloth bath mats, you should be able to wash them in your front load washing machine using a COLD cycle then air dry them. My white ones turned blue in the washer, I had used tide and bleach… will this help keep them white? Well, I don’t know why your white ones turned blue so I honestly can’t answer your question. Ordinarily, the solution is adding 1 cup of vinegar to the wash. With bathroom rugs, that can destroy the rubber backing. So, I’d recommend adding 1 cup of baking soda instead. Chances are you’ve got some build up on them which is causing the fibers to clump. The backing on my new bathroom rugs turned yellow in the wash. This has happened every time I buy new rugs and wash them. Is it possible to get rid of the yellow? How do I prevent this from happening in the future. I have tried cold water and Woolite, regular detergent with baking soda to soften water and just detergent alone. It doesn’t seem to matter which method. I have even tried warm water to wash.
I’ve never encountered this, Joann. Perhaps Oxiclean would help? Should i use liquid fabric softner in the rinse when wahing my rubber back bathroom rugs? I wouldn’t recommend it. Fabric softener makes towels less absorbent, and would do the same to the rugs.